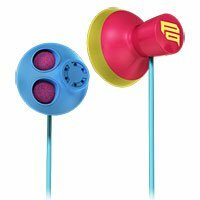 Keep your Sony MDR-PQ5/Z PIIQ Bass Earbuds from falling out with BudLoks™ - Far End Gear™ Products for outdoor enthusiasts - earbuds, earphones, and earbud sport grips. Bass in the hole, so to speak. The big bass producing Exhale earbuds feature a bass booster earpiece with sound ports and 13.5mm drivers for big bass and powerful sound. Additionally, the gas mask maintains snug fit while the cord slider helps prevent tangled cords. Big sound Big beat bluster in a bud body with a secret, sound-boosting motif. Only the masq knows. Insiders scoop Big drivers pushing big bass at high volumes requires big holes in the ear pieces. Hence, big eyes on the bass masq. Bass Boost 13.5MM drivers and bass booster earpiece deliver big bass and powerful sound.